This version of play songs is going to take you through the West African song from Ghana entitled "Woyaya" by Osibisa. . 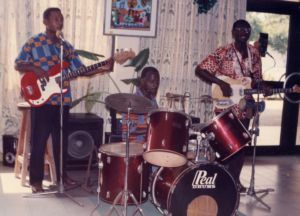 I learned this song from a fellow musician while living in Ghana. This was one of the songs in our repetoire while playing in the band called "No Dogs Allowed". After several requests from viewers on my youtube channel I decided to make a video tutorial playlist series which I have embedded below. History Of The Song "Woyaya"
Woyaya was written by Osibisa in the mid to late seventies. 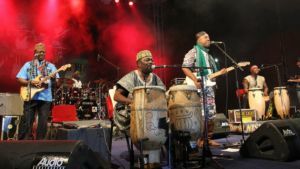 Osibisa was a West African group with members from Ghana, Nigeria and even the Carribean. They were a group that had heavy percussion and became very popular around the world. The word "Woyaya" means we are going. This word is from the Ga language of the tribe by the same name whose territory is in the capital city of Accra Ghana. The word Woyaya, when spelled in Ghana, the o is replaced with a letter that looks like a backward c. Incidently, the Ga tribe is one of the ony tribes I know of in Africa that made it a point to make a formal apology with a formal ceremony to apologize to the African American people for their ancestors (the GA tribe) part in the Trans-Atlantic slave trade. This song has a very popular and common African rhythm of 6/8 timing. Six beats per measure with each note being an eighth note. When the drummer plays the prominent beat you hear on the bass drum is 2 beats in the measure. So normally I count one two in each measure and the one two three is in the back drop of my mind for each one of the two beats in the measure. This concludes the overview of the whole song. For further details and step by step demonstration of each section please refer to the above video playlist. "Happy Playing".